I know – you’ve got the best dog in the world and he doesn’t bite. So why should you bother to train him to wear a dog muzzle? Dog muzzles have been used for centuries. The obvious advantage is to decrease the risk of bites or liabilities when you have a dog that might bite. So isn’t this antiquated gadget pretty useless today? 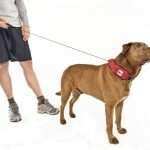 I intend to convince you that not only are dog muzzles still useful in today’s world, but that every dog needs to know how to wear one comfortably and that EVERY dog owner should learn how to teach his dog to do things that are a little uncomfortable at first. 1. The MOST IMPORTANT reason of all – you should be a competent enough trainer that you don’t have to force a dog to do anything. Yes, start with dog muzzle training because it’s fairly easy and because there are compelling reasons he should know how to wear one stress-free. I’m also going to argue that you should be a good ambassador for positive training and pass this article – or its ideas – on to your friends. 2. NATURAL DISASTER – We should all be prepared for natural disasters, even if you don’t think one’s going to happen in your area. When emergency workers come to rescue your dog, they will most likely muzzle him. The dog is already going to be confused and frustrated, and possibly wondering where you are and wanting to protect his home. For goodness’ sake, don’t make this one simple step an additional point of stress. 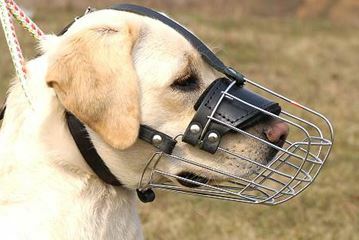 Especially if workers are rounding up many animals at a time, often of differing species, a dog muzzle will be used. 3. YOUR HEALTH – At any time, any of us could have an accident or an ailment. If anything should happen to you, and you get rushed to a hospital, it’s quite possible that your dog will need to go live with your cousin, the Crazy Cat Lady. Or with your uncle with the large fish pond. 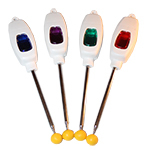 In other words, since you never know what’s going to happen, having such a simple, inexpensive, and painless device handy will help you in an emergency. Lack of training will not. If your dog knows how to wear a dog muzzle, what’s the worst that can happen? He’ll never need it and you’ll be better informed on how to train a dog to do anything, even if it seems weird to the dog. 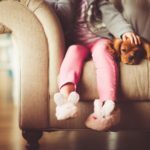 You can easily transfer this information to other areas where the dog would rather not cooperate: taking a bath, taking medicine, getting into the car, etc. 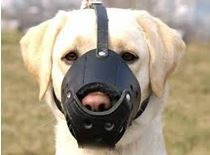 What is the training for a dog muzzle? 1. Get a muzzle and some small, but good, dog treats. Show your dog the muzzle, and give him a treat. Repeat a few times, then put the muzzle and treats away. 2. Repeat that first step once a day over the next few days. You’re not asking your dog to do anything except to get used to the sight of the muzzle. And you – be calm, check your breathing. What “vibes” are you giving out? 3. When the dog looks forward to seeing the muzzle, show it to him at closer range and give him a treat. Repeat this until he’s very comfortable. Over time, bring it closer and closer as you show it to him. 4. When he’s ready (and please, don’t rush it), touch it to his muzzle area, take it away, and remove it. So it’s touch – remove – treat. Repeat as many days as necessary until he’s got no fear. 6. When he’s ready, slide it partway on his nose, remove, and treat. Repeat. 7. When he’s ready, slide it on his nose all the way, but don’t latch. He might even be able to balance it on his nose. Remove and repeat. 8. When he’s ready, put it on all the way, latch, take it off, remove and treat. By now he should be getting the idea that you’re going to do something with the muzzle and then treat him after you’ve done it and removed it. 9. Once you’re able to latch it in the back with no trauma, start stretching out the amount of time you leave it on. At first, it will only stay on his muzzle for 1 second – then 2 – then 5 etc., until you build up a little time. 10. If you use a marker signal, like a word or sound to acknowledge that he’s done a task, do it right before you remove the muzzle and treat. Don’t make the mistake of going too fast. Remember that your dog does not tick days off of a calendar the way you do. Your dog is in no special hurry to learn this trick and will go at his own speed. It might take one hour, or a whole year. It really depends on your skill, your dog’s past experience, and other factors like genetics and environment. Pretty soon, you can tell your friends and neighbors that you taught your dog to wear a dog muzzle because (1) you wanted to be an awesome trainer; (2) if anything happened to you; or (3) your dog ever needed transportation due to emergency. Please pass the secret on. And please comment below – tell us how you taught your dog to do something with no fear or trauma involved. And if your dog knows how to wear a dog muzzle, please let us know that, too. Worst: No air can flow, the dog cannot breathe well, drink, or pant. Okay. The dog can eat and drink if the front is open. However, he still can’t pant easily. 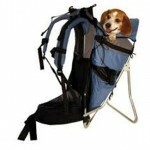 Best for most uses: Very easy for dog to breathe and there is a cushion on top. «Is Cephalexin Safe For Dogs?